Mövenpick Hotel Colombo නවීන සංකල්පයක් හඳුන්වාදෙමින් ප්‍රථම වරට ‘Mövenpick Weddings’ දියත් කරන ලදි. Intimate. Precious. 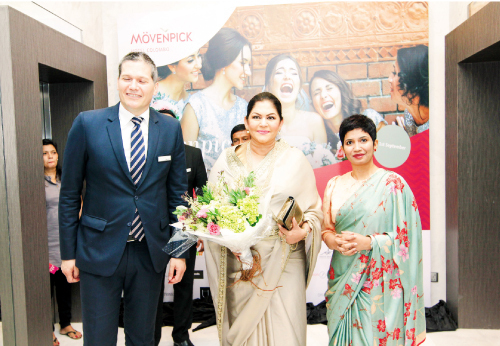 Extraordinary යන්න තේමා කරගත් ‘Mövenpick Weddings’ fair පසුගිය දා නගරාධිපතිනි රෝසි සේනානායක මහත්මියගේ ප්‍රධානත්වයෙන් සහ Softlogic Holdings PLC හි සභාපති/ ප්‍රධාන විධායක නිලධාරී අශෝක් පතිරගේ මහතාගේ සහභාගීත්වයෙන් පැවැත්වීය. Buddhi Batiks, මයිකල් විජේසූරියල The Bridal Atelier by Ramona Oshini, Hameedia, Ramani Fernando Salons සහ Aslam Hussein, O:Live Couture, Belle Amour, Elegance by Design, Wedding Connections, Shirohana, Lassana Flora, Petals, Alankara, Stone-N-String, Unique Jewelers, Fashion Fabrics Events by Shero, The Banquet Company, Studio 3000, Studio U සහ නදුන් බදුගේ ‘Mövenpick Weddings’ fair සඳහා ඇතුළත් වූ නිර්මාණකරුවන් අතර වේ. මෙරට ප්‍රමුඛතම Bridal සඟරාව වන ‘Brides of Sri Lanka’ නිල සඟරා අනුග්‍රාහක ලෙස එදින කටයුතු කළ අතර, සුන්දර මධුසමයකට සරිලන නැවතුමක් වන Mövenpick Resort Kuredhivaru Maldives ශ්‍රී ලාංකිකයන්ට හඳුන්වාදීම ද එදින සිදුවිය.